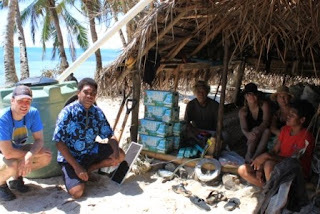 Tui Tai's Charitable fund has allowed us to be able to deliver many needed supplies to remote villages in Fiji suffering after the wake of Hurricane Tomas. Some of the items seen here that we are bringing to help these villages include Water tank, Fiji bottled water, PVC piping, digging fork and spade, nails, hammers, metal siding, solar panels, lanterns, soap, seeds to replant crops, and other various items. It has been very interesting hearing the first hand accounts of many of these villagers as we interview them about their experience during the cyclone and how bad it damaged their houses, roads, crops, trees, and in some unfortunate cases lives were lost. The amazing resilience and spirit of the Fiji people has kept them going and working to rebuild what was lost in this natural disaster. Thank you to all that have helped donate to the charity. For those that have been here, you know that the Fijians are some of the most friendly and kind people in the world, never asking for much other than a returned "Bula!" when you see them. It is for this reason and many more that we gladly can extend our hand in help to them during this time of need.